For the past few months I have devoted some effort to a quest for simplicity. I have been cleaning out drawers and closets, decluttering and donating. I have tried to remember to ask myself serious question before acquiring anything; questions like... Do I really need it? How often will I use it? and Where am I going to put it? On the whole I am seeing a positive impact on my domestic landscape. Perhaps it was time to ease up a little, to open the space I had created to the whims of serendipity. Perhaps I was just weak. Whatever the reason, I was reminded this past week that I remain susceptible to the momentum of a single idea, especially one that involves the kitchen arts. I also remain susceptible to the debris field such an idea can bring along with it. It began with the best of intentions. My objective was to declutter the family room. I sat down to look through my monthly collection of magazines, to file anything I wanted for future reference and discard the rest. I was flipping through the pages of Sunset dreaming of summer barbecues and enjoying photos of happy families dining on colorful salads and grilled meat in the warm sunshine when something jumped off the page and caught my eye. There on page 97 was a recipe for Grilled Strawberry Shortcake Kebabs. 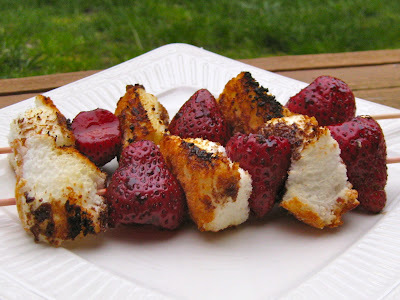 The grill marks on the neatly cut squares of Angel Food Cake were perfectly seared at an attractive angle while the strawberries were clearly firm but juicy and covered in a sweet sauce. My mouth watered. I have already written about my delight in toasted slices of Angel Food Cake. 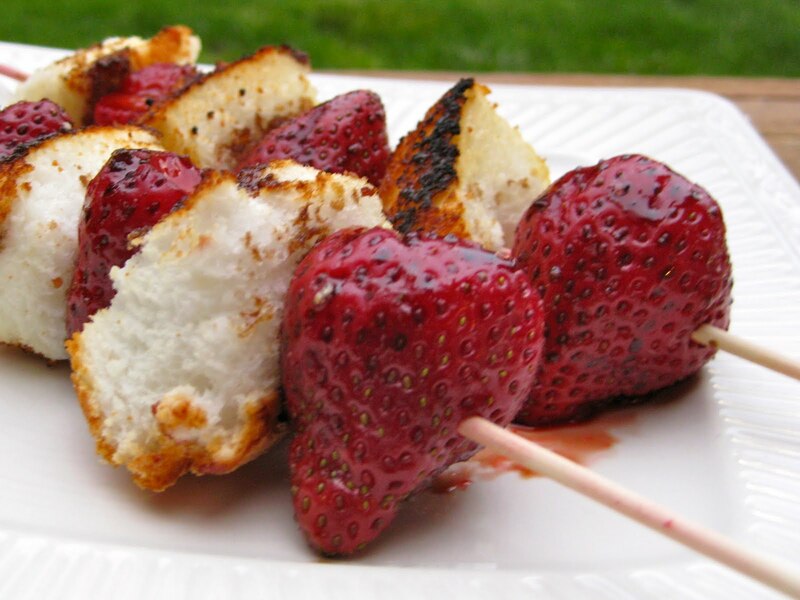 Grilled strawberries seemed like the next step and a perfect addition. It is often the small things, the seemingly innocent distractions that get us in the end. That afternoon I happened to be shopping for replacement cushions for my patio furniture. While my intent was to make a purchase I was still following my guidelines for simplicity. The cushions that came with my furniture were white and after one short season needed to be replaced. Without dwelling on the shortcomings of my decision to buy that set in the first place I was ready to take it in stride and move on. I found just what I was looking for in a bright cheery red. I grabbed two single chair cushions and one longer bench cushion. Arms full I turned toward the register. Then I saw it: a cute little tabletop grill. Seeing that Mini Fire Pit Grill was like fitting a piece into a nearly finished puzzle. It pulled together colors from the past and brought them into the present with one tangible piece of equipment. Suddenly I remembered an hibachi grill that my husband and I invested in, back in the day. It was small and practical. We would put together shish kebabs or marinate steaks, pack them up with our grill and blanket and set out for wonderful picnics in the park, preludes to summer concerts or free performances of Shakespeare under the stars. That hibachi grill was well-used when it began to fall apart. It is long gone but the memories, well….. This little grill was adorable and reminded me of good times. Over the years the memory of the functional details of that hibachi had faded allowing this grill to whisper lines from Shakespeare and promises of rekindling the magic of those summers past. 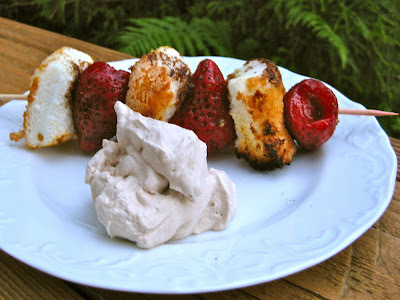 I envisioned Strawberries Shortcake Kebabs grilled tableside. I smiled to myself and took the box to checkout along with the cushions. At home I realized I’d forgotten a few things. Since we now own a fully plumbed gas grill and have no other grilling equipment I found that we had no charcoal briquettes or starter fluid. Another trip out to pick those up and I realized I was unlikely to find enough time to bake the Angel Food Cake I would need. Still I was hopeful. Back home, I opened the box, took out the pieces of the grill and unfolded the instructions. After some assembly, I set it on the patio and stacked the briquettes to light them. The first batch fizzled from lack of enough starter fluid. The second lit as the unappetizing scent of kerosene wafted through the open windows of the kitchen where the rest of our dinner was cooking. When the coals were ready I noticed the arrangement of racks on the grill required the food to be nestled very close to the coals for cooking. There were no adjustments. Trusting the wisdom of this arrangement I put the kebabs on to cook and grabbed my camera in hand. If you know much about grilling you have likely already anticipated the outcome. Before those strawberries began to sizzle the cubes of Angel Food Cake were charred. As I tried to turn the charred side away from the fire, they stuck. There were no grill lines, no toasty brown diagonal stripes, just black. 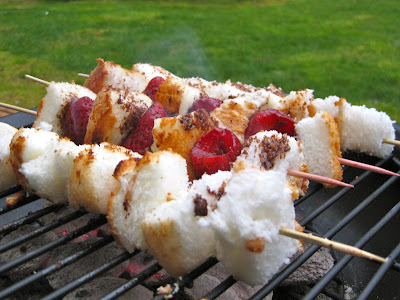 The kebabs began to look more like S'mores Gone Wrong than an inspired version of Strawberry Shortcake. After scraping the first batch from the grill rack I tried again. I was more careful with the second batch. My husband turned the kebabs frequently, for just two or three minutes. I took a decent photo or two. Still no carefully defined grill marks developed but the overall appearance of the kebabs was edible if not mouthwatering. Satisfied, I finished up, plated the kebabs with whipped cream and tried to set the grill aside. It was then I discovered the base was nearly as hot as the top and had no business resting on the tabletop or the back deck or anything else made of wood (or most other materials seasonal merchandise is made from). The base was hot, hot, hot! With cooking gloves my husband moved it to a concrete footing to cool while we ate. This past weekend, in accord with our renewed quest for simplicity, my husband cleaned up a little in the garage. He made a pile of things that needed to be discarded and took them out to the driveway: a few pots from dead or discarded plants, a broken weedeater and edger, some old folding chairs we don’t use, some statuary and summer yard decorations our family has outgrown and a nearly brand new tabletop grill, along with better than half a bag of charcoal briquettes and starter fluid. Sometimes it is best to just cut your losses and get back to the task at hand. Cut the Angel Food Cake into 1½- to 2-inch cubes with a serrated bread knife. Thread the cake and strawberries alternately onto the skewers. 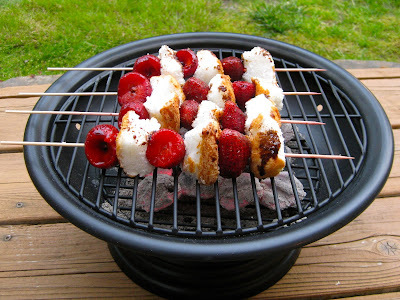 If the strawberries are large, use two skewers in parallel for each kebab to help stabilize the kebab for turning. In a small bowl, stir together the balsamic vinegar and brown sugar until the sugar is nearly dissolved. 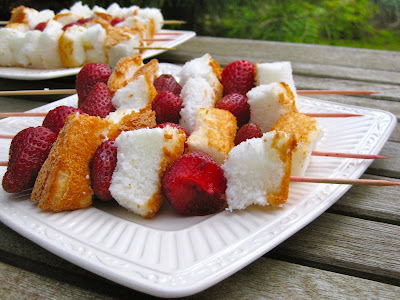 Brush the brown sugar mixture on the strawberries, drizzling a bit over the cake cubes if you like. Whip the cream with the remaining brown sugar mixture. Add a little more sugar if desired, to taste. Place kebabs on preheated grill for approximately 2 minutes per side, turning once. Close the lid, if your grill has one, after turning. Serve kebabs with the whipped cream (or with cream fraiche) for dipping. I think the idea is fabulous, even though they are a work in progress! Lovely blog. I found you while trying to figure out when Maryhill peaches will be ready and found your peach pie recipe. What a lovely way to serve strawberry shortcake! My family would love this version. Great idea for a sweet kebab. Thanks, Kaylene! Glad you stopped by.